Welcome to Day 3 of Ice Cream Week 2014! This year the event is hosted by Kim of Cravings of a Lunatic and Susan of The Girl in the Little Red Kitchen. We have teamed up with 25 amazing bloggers to treat you to tons of amazing ice cream recipes. Have you entered into the giveaway? Ice Cream Week is shaping up to be the best week ever! Do you ever want a cold sweet creamy dessert, but you don't feel like working too hard for it? This is where I was, mentally, the first time I made this dessert. I didn't have any eggs or heavy cream on hand and didn't feel like walking a mile down to my local grocery store--nor sending the kids. Nope, like I say in the title, I was just in a lazy mood. I opened the fridge instead. In keeping with my desire not to waste food, I started with some fruit salad that was leftover from breakfast. Using only what I had in the fridge/pantry, my daughter and I concocted this treat. When I heard about #IceCreamWeek I decided to make it again, take photos, and write the directions down so you could be lazy too. This recipe is not a very labor-intensive undertaking, not like making an ice cream pie at home. Shoot, if you don't even want to turn on the stove to toast the nuts--skip it. You'll still get a sweet treat with little effort. Note: This recipe uses a frozen banana. I don't like to eat bananas that are all spotty, so once they reach that stage I toss them into the freezer (in their skins, the perfect covering). If you don't have any frozen bananas a fresh one would probably work as well. 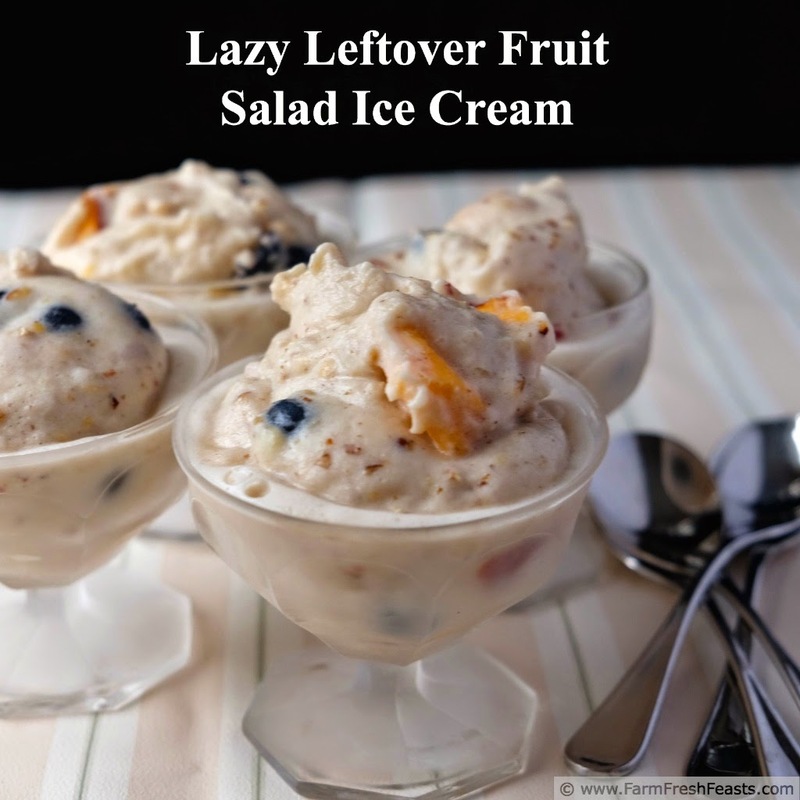 Another Note: This recipe uses an ice cream maker with a pre-chilled bucket--so make room in your freezer for that bucket--it lets you be lazy! This recipe uses a stove or hot plate, an ice cream maker, and a freezer. Preheat a dry skillet over medium high heat. Toast pecans in skillet until fragrant, about 2-3 minutes. Remove from heat and set aside to cool. In a large bowl, whisk together milk, yogurt and brown sugar. Stir in banana pieces. Churn in an ice cream maker according to manufacturer's instructions. Mine takes about 15 minutes before it start thickening. 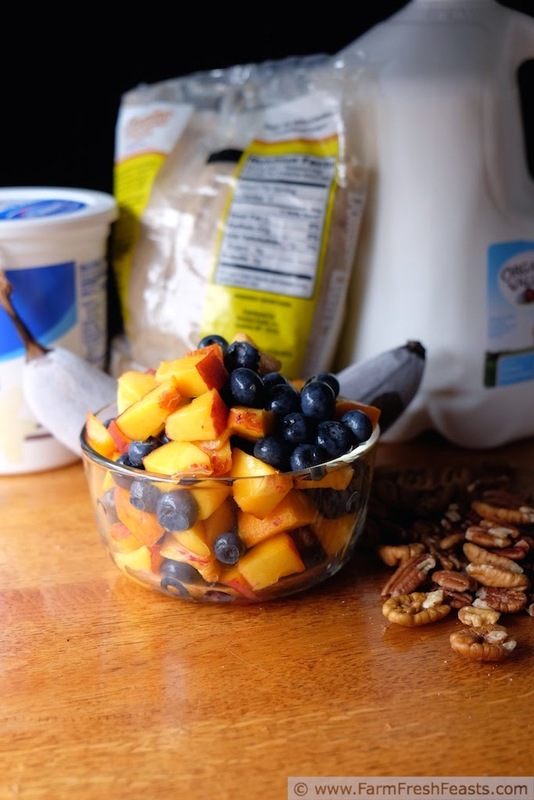 Once the ice cream starts thickening, add chopped fruit and toasted pecans to the ice cream maker. Churn 5 more minutes. 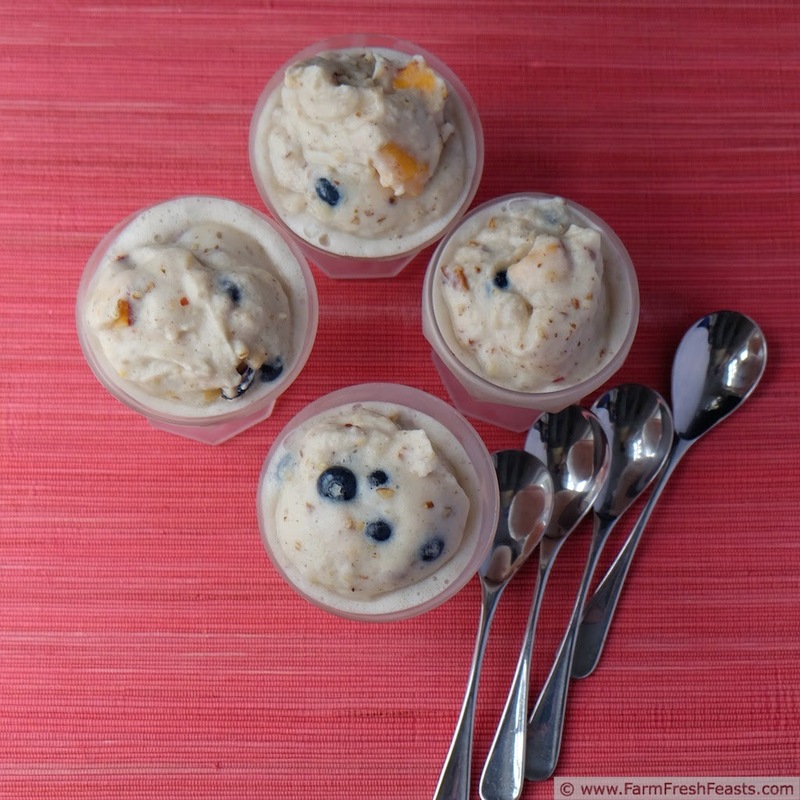 Serve at once for a soft ice cream, or transfer to a freezer container and freeze for an hour until firm. You are speaking my language when talking lazy - especially with the summer heat we've been having here in FL!! 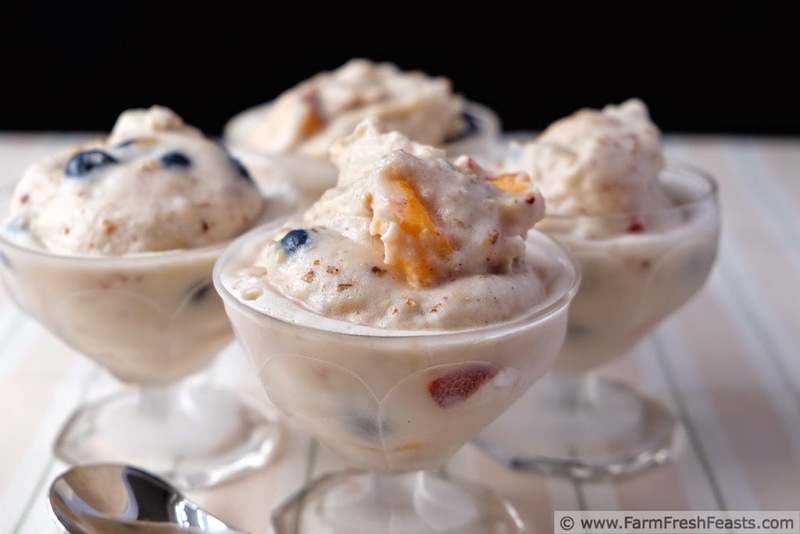 Fruit and ice cream go so well together to make a refreshing treat! This looks fantastic, so glad you were inspired to make it again and write down the directions! Thanks! Why is it that we can't finish up a fruit salad? Eyes bigger than stomachs or bountiful spread or just pancake overload, I don't know. This is such a great idea!! I hate wasting leftover food, too! Cute idea, love the pecans in there too!! Thanks--I like a bit of crunch with my ice cream so nuts are my go to! My favorite ice cream flavor changes with my moods... always partial to anything chocolate, love pistachio, and anything with lots of crunch in it. How fun--I switch around too, but usually never anything all fruity. Unless it's a hot summer day and there's peach ice cream. Then I'll throw the chocolate/crunchy out the window. I love ice cream and fruit together! What a great recipe! Ice cream is just a happy place. Thanks! You bet it ice cream is a happy place! Covered in hot fudge and nuts . . . I could go for a frozen banana slushy too. That sounds appealing. Love the name - you really can add whatever you want to ice cream. If I have added beets to ice cream then yes, you really can add whatever you want to ice cream!